McClain’s John Salyers smacks a line drive single in the bottom of the third inning on Wednesday at Mitchell’s Park in Greenfield where the Tigers battled the Ironmen in FAC play. Mason Ratcliff throws a pitch in the fifth inning on Wednesday vs Jackson. McClain beat the Ironmen 10-7 in the FAC rivalry game. 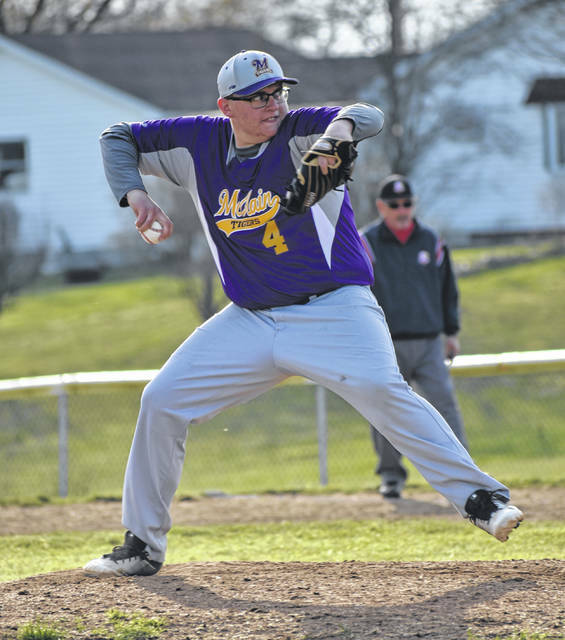 GREENFIELD — The McClain Tigers varsity baseball team hosted Frontier Athletic Conference rivals the Jackson Ironmen on Wednesday at Mitchell’s Park in Greenfield and used a five run second inning to propel themselves to a 10-7 FAC win. Sam Faulconer earned a walk to start things off for the Tigers in the bottom of the second inning and Garrison Banks followed up with a line drive single before a sacrifice bunt from Evan Hutchinson advanced both runners into scoring position. Wyatt VanDyke fowllowed with a walk to load the bases and Eric Anderson singled on a line drive to right field that plated Faulconer for to tie the game at one run apiece. Colton Mossbarger was hit by a pitch that resulted in Banks scoring the go ahead run that gave the Tigers the lead for good. John Salyers smacked a hard ground ball past the Jackson shortstop and Anderson and VanDyke scored on the play to extend the Tigers’ lead to 4-2. Mossbarger scored the final run of the inning for McClain on a single by Cody Pollock but, Salyers was put out trying to score for the Tigers as they took a 5-2 lead into the third inning. 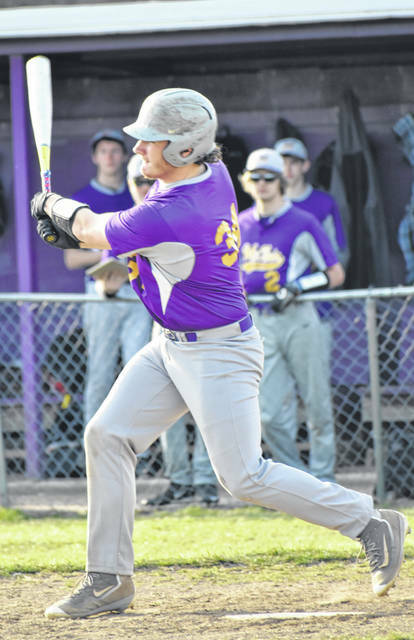 After the Ironmen scored two runs in the top of the third inning the Tigers answered right back with three runs of their own in the bottom of the third inning. Banks scored on a fielder’s choice bunt by VanDyke that pushed the McClain lead to 6-3. VanDyke went on to score on a wild pitch during Salyers’ third inning at bat and Anderson who singled earlier in the inning was plated by a single off the bat of Salyers that pushed the lead to 8-3. The Tigers weren’t done in the inning and a double off the bat of Pollock scored Salyers to make it 9-3 before the Ironmen got the final out of the third inning. Banks scored the final run of the game for the Tigers in the bottom of the fourth inning on a single by Anderson. Jackson scored one run in the first, two in the third, one in the fourth, two in the fifth, and one in the seventh but were unable to catch the Tigers. Mason Ratliff was on the mound for the Tigers and pitched six and two thirds innings before being pulled with two outs in the top of the seventh inning due to pitch count. The Tigers will be on the road Friday when they travel to Miami Trace to take on the Panthers in an FAC baseball matchup.